Dr. Richard Hill and his family were part of the substantial Quaker community in America. Born in Maryland in 1698, Hill married Deborah Moore whose grandfather was the governor of Pennsylvania. Hill was a surgeon, an amateur botanist, and a merchant—he owned four ships. In addition he owned several parcels of land and at least forty slaves. When he came upon hard times and was denied “immunity from debts,” he sold most of his assets and relocated to Funchal in Madeira where he tried to build a business in the wine trade. He eventually prospered sufficiently to repay his creditors and make a comfortable living. Hill and his wife had ten children. Hannah, his eldest daughter, at age fifteen married the grandson of his wife’s sister, Dr.Samuel Preston Moore. She and her husband lived in Philadelphia where Hannah became the surrogate mother to her siblings who did not accompany their parents to Madeira. Her sister Sarah married George Dillwyn, a Quaker preacher; they lived at Green Bank (Burlington), New Jersey. Another sister, Margaret, married William Morris Jr., a dry-goods merchant, who died in 1765, less than eight years after their marriage, leaving his wife with three children and expecting a fourth. The following letter written by SARAH DILLWYN to MARGARET MORRIS contains, to me, a very sad passage. (See the many other posts about Margaret Morris here, here, here, here, here, here, and here). I was rejoiced yesterday to hear from under thy own hand, that thy precious little one was on the recovery; but, my dear creature, don’t be too secure—try to give her up freely—still—and whether she lives or not, thee will be rewarded with peace of mind. Sister [Rachel] Wells found it the best way to be quite resigned, though it was hard work for her. . . . I intend to send a few apples for the children; tell me if acceptable, and I’ll send often. Sarah is cautioning her sister not to become too attached to her child as the little one may be taken from her by illness at any time. She should prepare herself for this possibility in advance, resign herself to her loss as the will of God. (Their sister Rachel had a child in July 1763; he died in August of that year.) This may have been sensible advice at a time when the death rate among infants was high but it is not the way we look at our children today. The letter is painful to read—and to realize how often mothers lost their babies. Sources: John Jay Smith, ed., Letters of Doctor Richard Hill and His Children 1798-1881 (Philadelphia: 1854),196. Also John W. Jordan, Colonial And Revolutionary Families of Pennsylvania (New York, 1911) 43-46. 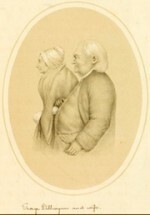 The portrait of Sarah Dillwyn and her husband is at the Library Collection of Philadelphia.